BIODATA to display in a new window ! To enumerate the cumulative impacts of the topic on which papers are being contributed at international conferences it is necessary to recall that the poster presented at the Joint ISMAR-CA?98 was the material presented at the NMRS(India) Symposia at IIT/Delhi (1997) and at IISc., Bangalore (1998) which even in India evoked an interest and later found acceptable alsoto be presented at International conference. This work has yet to be pursued for better results to be conclusive. This effort was to use a Magnetic dipole for Shielding (Induced Fields) calculations and the results till now on this could further substantiate the reproducibility of the Deagnetization factor Calculations by using the same approach and equations for induced field calculations with an additional constraints and equations used for summing over semimicrovolume elements for the whole macroscopic specimen. While presenting these approaches for the Macroscopic Magnetized Specimen in India at the Dehradun,IIP (1999) Symposium the abstract could be presented giving the rationale for the necessity of semimicro volume elements and the derived equations inquiring as to whether all these are only a mere mathematical simplification OR can there be more to it. Later the interest from the audience and viewres of posters resulted in presenting the Full explanations and calculation of Demagnetization factor and its reproducibility and these were the considerations at the NMRS Symposia at TIFR,Mumbai (2000) and at Chennai,CLRI/IITM (2001) which were summarised as POSTER presentation at the 2nd Alpine Conference on Solid State NMR ,Chamonix Mont-Blanc,France (2001). Soon after there were messages received from the participants expressing much interest in the material and these materials are being more carefully studied by them as per the messages, from the point of view of the posiible applications indicated. The presentations at XIII International Biophysics Congress, New Delhi (1999) and in the XIV IBC at Buenos Aires,Argentina (2002) have highlighted and explained the induced fields and their calculations from the point of view of Membrane transport studies by NMR methods and further efforts to improve the applicability are being pursued. The purpose of all the national and international presentations are being more and more substantiated by the interest of the Organizers (National &International) of Conferences. The explanations for the workability of this simple procedure for induced calculations raises a few questions which must be clarified and explained before detailed application of the method. In Feb 2003 in the National Symposium on Biophysics, a typical consideration of a aromatic-ring susceptibility tensor was used to illustrate the consequences of induced fields calculated in the tensor form at a point nearby the ring. On the basis of the simple procedure being used for the calculation of Induced Fields due to the magnetized specimen in the regions inside and outside this Uniformly magnetized Specimen and the inferences based on the already known demagnetization effects, an inquiry was put forth as to what really are the criteria for the specimen shape and the shape for the semimicro volume element (a cavity) would apply to know the trends of field distributions inside a magnetized specimen. This was the content of the oral presentation at the NMRS2003 in IISc., Bangalore. A suggestion could be made in these considerations that if the Lorentz cavity is chosen to be a nonspherical shape , an ellipsoid for that matter, then within this volume element the discrete dipoles would contribute at a nuclear site inside induced fields and, will these trends be the same as it is for spherically shaped Lorentz Cavity? At the 3rd Alpine Conference on Solid State NMR, France during Sept 14-18,2003 the above question could be certain extent answered from the numerical trends from a simple lattice sum calculations for CUBIC & NONCUBIC lattices when a spherical and nonspherical (ellipsoidal) inner volume elements are considered. it seems the Lorentz Cavity need not be only spherical since even for an ellipsoidal shape of comparable semimicro volume element the discrete poit dipoles yielded the same limiting sum value for the total contribution from all the dipoles within the volume element. Hence the Lorentz cavity need not be only of spherical shape. Then for the same dimensions for all cases the CUBIC lattice yielded the same numerical value indicating a near zero contribution but for noncubic lattice the limiting sum varied significantly depending on the relative ratios/magnitudes of the lattice parameters. And even in this ellipsoidal case the limiting values did not depend on the elliticities for the ellipsoids and all values were close to the nonzero values obtained for the spherical case. B.Sc., Mathematics,Physics and Chemistry(general), Government Arts and Science College, Chittoor, A.P.,India , 1962-1965 Grade Obtained: Distinction (marks >75%) with university second rank of merit. Post Doctoral Fellow,Max planck Gesselschaft, at Max planck Institute fur Medizinische forschung, Abteilung Molekulare Physik. Heidelberg, Germany , year 1975-77 in the research area of High Resolution NMR in Solids: multiple pulse line-narrowing experiments for the determination of Shielding Tensors of Proton in single crystals of organic molecules. Experimental design and construction of rf Probes for the proton enhanced rare nuclei detection of N15 containing single crystal specimen. A Tenure appointment as Wissenschaftliche Mitarbeiter in the Fach Bereich Physik at the Institut fur Atom und Fest Koerper Physik, Free University of Berlin, Berlin Germany to work on Optical Nuclear (proton) Polarisation Enhanced detection of Rare Nuclei by Hartmann-Hahn proton polarisation transfer technique followed by rare spin FID detection for the determination of the Shielding Tensors of Rare Nulclei. Year 1977-78. As Scientist at National Chemical Laboratory, Pune, India during 1979-80. at the FT NMR facility of NCL. 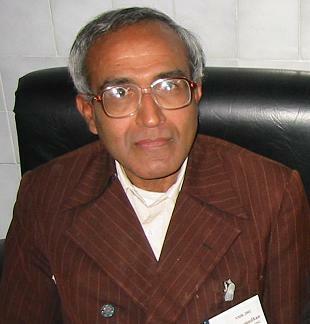 As Research Associate at the Department of Chemistry, Indian Institute of Technology,Kanpur,U.P., India in the research project on Multiple Pulse Line Narrowing Technique for Nuclear Quadrupole Resonance Studies, during 1982-83. 6. Proton Shielding in Single Crystals of alpha - Oxalic Acid Dihydrate ; Comparison with Deuteron Shielding : S.Sagnowski , S.Aravamudhan and U.Haeberlen , J.Chem.Phys., 66 , 4697 , (1977) RJ 2. 7. Wide-line and High Resolution Proton Magnetic Resonance in Single Crystals of Malonic Acid: S.F.Sagnowski , S.Aravamudhan and U.Haeberlen , J.Mag.Res., 28 , 271 (1977) RJ 3. 8. Pyromellitic Acid Dianhydride ; Crystal Structure and Anisotropic Proton Magnetic Shielding : S.Aravamudhan , U.Haeberlen , H.Irngartinger and C.Krieger , Molecular Physics , 38 , 241 (1979) RJ 4. 9. An Aspect of Hgh Resolution PMR in Solids at Higher Magnetic Fields : S.Aravamudhan and P.T.narasimhan , 14th Annual meeting of the Association of Magnetic resonance Spectroscopists of INDIA , IISc Bangalore , India (1983) NS 1. 10. Use of Magnetic Diploe for the calculation of Shielding Tensors , S.Aravamudhan and A.Tomba Singh , 3rd NMRS Symposium , IIT Delhi , New Delhi , India (1997) NS 2. 11. Implications of Calculating the Full shielding Tensor of Protons in Benzene Molecule Using a Magnetic dipole Approximation : S.Aravamudhan and A.Tomba Singh , 4th NMRS Symposium, IISc Bangalore , India (1998) NS 3. 13. On the possibilities of Calculating Demagnetization Factors by Lattice-sum od Considerations : S.Aravamudhan , 5th NMRS Symposium , Dehradun , India (1999) NS 4. 14. On The possibilities for a Method to Facilitate Membrane Transport Studies Based on Bulk Susceptibility Differences and NMR , S.Aravamudhan , Journal of Biosciences , 24 , Supplement 1 , page 132 (1999) . XIII International Biophysics Congress , Poster P284 , New Delhi , India (1999) IC 6 & RJ 5. 15. Calculation of cavity Field in a Spherical Sample with concentric Spherical (Outer and Inner) Compartmens : S.Aravamudhan , National symposium on Magnetic Resonance and Biomolecular Structoure and Function , TIFR, Mumbai, India (2000) NS 5. 17. A Report on the Demagnetization Factor and Induced Field Calculation for Standard sample Shapes : S.Aravamudhan , Symposium on Spacially Resolved Magnetic Resonance and 7th NMRS Symposium , CLRI / IIT Madras , Chennai , India (2001) NS 6. 19. Applicability of a Reported Simple Method of Calculating Induced Fields to Calculate Contour-maps of Ring-current-effect Shielding valuesfor Macro-(Bio-)molecular Structure Determinations, Discussion Meeting on Structural Biology & Symposium on Biophysics, Jan.21-23,2002. Deaprtment of Crystalography and Biophysics, University of Madras. Auspices of Indian Biophysical Society. NS 7. 20. NMR 2002 : Shielding and Demagnetization factor Calculations: Molecular fragments Making up the Whole Molecule; Close-packed Volume Elements Making up the Whole Specimen. 8th NMRS Meeting, Jan.23-24,2002,Centre for Biomedical Magnetic resonance,Sanjay Gandhi Postgraduate Institute of Medical ciences,Lucknow NS 8. A revised draft of application for Grant for a Project is being finalized. Activities as EX LECTURER, Department of Chemistry, NEHU: Currently a molecular dynamics calculation is being envisaged using a PCGAMESS soft ware to be able to know the trends in the inter molecular approaches and dispositions while the molecules get closer or when they are closely packed. On the basis of this, it would be possible to arrive at appropriate molecular clusters at optimized locations with respect to each other. The position coordinates of such structures can further be used as inputs into calculations using DFT algorithms to find the extent of intermolecular contributions in the cluster of molecules in comparison with the isolated chemical shift values. This approach can be yielding the necessary criteria for improving the applicability of Magnetic Dipole Model for intra and inter molecular Shielding contributions as envisaged in the two references cited at the end of the enumeration under “Impact of Results” in the beginning of Annexure-I above in the resume. An example of the efforts made in this direction is the Video movie file embedded in the webpage: http://www.geocities.com/saravamudhan1944/ugc_inno_proposal.html"
CLICK HERE for an elementary & introductory article by Dr.S.Aravamudhan. Title: "NMR as a tool for Structure Determination"
Total = 65 -2 = 63. "Shielding Parameters of Nuclei: ...........Crystal Structure..............Molecular Electronic Structure"
CLICK HERE to view selected 8 Web Pages of Dr.S.Aravamudhan displayed as ' FRAMED ' pages in view at a single and same Desktop display. Total = 52 -2 = 50. Displayed as ' FRAMED ' pages in view at a single and same Desktop display.